Tragedy has once again befallen the Mushroom Kingdom. 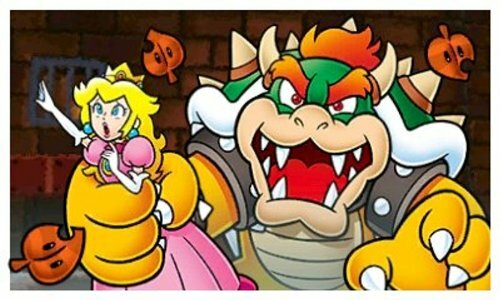 A ferocious storm has washed away all the Tanooki Leaves from the trees and, whilst inspecting the damages with a group of Toads, Mario receives a letter from Princess Peach revealing that she has once again been kidnapped by King Koopa himself, Bowser – will she never learn?! Super Mario 3D Land has arrived, at last, a resounding charge against Nintendo 3DS naysayers too quick to denounce the ailing handheld. Continuing to exuberate the technicolour splendour and charm of the series through every pixel, levels vary immensely from one to the next as Mario carefully balancing along tightropes as Bullet Bills whizz towards the screen one minute, to then find himself fumbling in the dark as he evades menacing Boos the next. Such variety becomes the game’s most significant delight, a surprise at every turn ensuring the player’s progression is one of immense joy – an unnerving grin ever present at the quality of level design and the fast-paced challenge that Nintendo set before you. For those that have enjoyed the series throughout its history, there are frequent nods to past entries clearly evident – Super Mario Bros. 3, in particular. 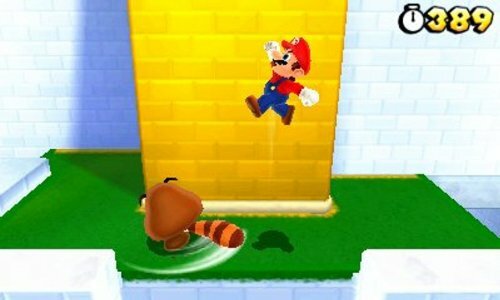 The return of the Tanooki Suit has been more prominently in the spotlight, yet other elements such as Flag Poles, Musical Blocks that blast you into bonus sections and Mario being able to be reduced to half his height also show this. There are also a number of surprises including the Propeller Block and Boomerang Suit, and a Question Mark Block that gets stuck, humorously, on Mario’s head when he attempts to hit it. Enemies also receive variations, including Piranha Plants that can cover the screen with black oil and those that can breathe fireballs, Thwomps that copy your movements and Bullet Bills with Tanooki tails that, if they miss you, take a desperate swipe at you. Boom Boom also returns as a boss, and you’ll encounter Fake Bowser’s with Tanooki tails on your journey to save Princess Peach. 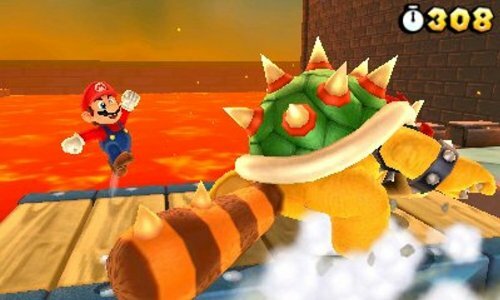 Mario remains to be just as athletic as ever, gleefully hopping through levels – bouncing on goombas and dodging swinging traps as he goes. He has, however, lost his triple-jump temporarily, yet this is replaced by the ability to Dash (by pressing Y) and signature moves such as wall jumping also remain. Whilst there are plenty of mechanics here that most will be familiar with, it is minor twists on such a tried and tested formula that allow each new Mario title to feel as fresh and new as any of its predecessors, and Super Mario 3D Land is no different in this regard. The game is also perfectly designed for short burst play, with players able to best the majority of each individual level’s enemies and obstacles within a matter of minutes. This, naturally, opens up the game to the challenge of speed runs – popular in the days of the classic 2D entries in the series, but an element that hasn’t re-emerged since the plumber transitioned into the realms of 3D on the Nintendo 64. Those that find themselves able to trawl through the game’s eight Worlds with a relatively quick pace – which will take the average player approximately five hours – needn’t fret, either. Whilst each level hides three Star Coins for the collectable aficionados amongst you, upon completion you will soon discover that Nintendo has hidden away an additional series of eight Special Worlds that really step up the difficulty immeasurably. This is also where the importance of collecting Star Coins becomes all the more evident. A total of 100 are required for you to complain the core Worlds, whereas progression through these Special Worlds requires increasing increments of 10 Star Coins. It’s worth it too, with this second selection of levels even eclipsing the quality of those before it, and really pushing you to your limits at every turn. Whereas the initial batch of levels sees you filled with confidence as you steadily collect an impressively large quantity of 1UP Mushrooms, this is the point at which that amassed pile of extra lives that you recently boasted to your friend about are soon flung down the drain! You’ll face challenging factors such as Cosmic Mario, Poison Mushrooms and more agile enemies, as you attempt to speed your way through old levels with heightened difficulty mixed with entirely new ones. To counterbalance this, the player is also offered more aid through more frequent Invincibility Stars and a new Tanooki Suit which allows you to turn to stone to protect yourself from incoming dangers. That’s not all either, as completing the first Special World also rewards you with the ability to play as Luigi – although some of the Power-Up Suits look a little odd on him! It is a hallmark of the ingenuity of Nintendo’s careful difficulty pacing, and I’ve had to laugh off my frustration on numerous occasions during the many moments that these levels caught me out. Believe me, they will catch you out. Nintendo has also seen fit to utilise gyroscopic controls at sporadic points throughout the game, at which Mario will find himself stumbling upon a fixed Binocular point. These shift to a first-person perspective, during which you’ll be able to scout out the path ahead or spot stranded Toads who, once located, will throw 1UP Mushrooms or Star Coins into the forthcoming section of the level. It’s a nice addition that serves to break up the pure-platform play, yet one that isn’t overly used to detract from the experience. Even StreetPass has been implemented, with players able to engage in a Time Attack mode once they’ve cleared the normal stages. You’ll be able to view times of other Super Mario 3D Land players that you pass, with whom you’ll then be able to race against in an effort to not only beat them but possibly learn tricks to improve your own records. You can also benefit from those that don’t even have the game, as for each Mii character you meet through StreetPass will provide you with a Mystery Gift. The more times that you bump into someone, the better the item you receive as well – although, I haven’t reached the upper echelons of this yet! A Super Guide also returns, five consecutive deaths on a level offering the player the opportunity to adorn a White Tanooki Suit that grants invincibility alongside the suits abilities, whereas if you lose ten lives you’ll be able to utilise a P-Wing item (previously seen in Super Mario Bros. 3) that blasts you straight to the flagpole at the end of the level. 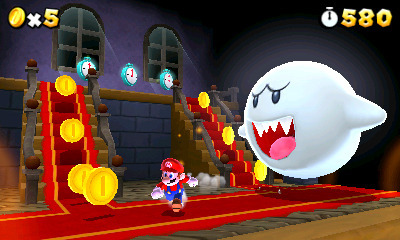 Super Mario 3D Land is an embodiment of what the Nintendo 3DS has been lacking since launch. Whilst many decry Nintendo for falling back upon their tried and tested franchises, it is the arrival of Mario – the consumer familiarity of his blue dungarees, red cap, and that magnificent moustache – that will, at last, provide the much-needed boost to turn the handheld’s fortunes around, and through one of the most enjoyable handheld releases I’ve ever encountered.